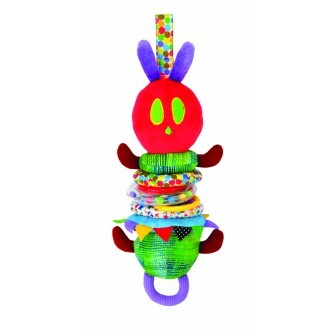 The Very Hungry Caterpillar Wiggly Jiggly Hanging Pram Toy. Ideal for sensory play, this Wiggly Jiggly version of the Very Hungry Caterpillar will be an entertaining toy for newborns and young children. When you pull down on the caterpillar his body retracts up and jiggles. With a handy Velcro loop, this developmental toy can be attached to a pram or cot for on-the-go play and includes seven brightly coloured fabric or plastic rings to stimulate baby’s senses. Presented on a hang-sell card. Suitable for birth and up.